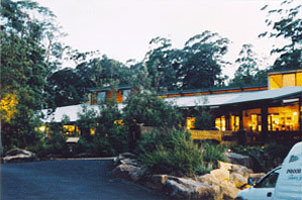 The brief was the result of a winning a nation-wide design competition run by the then Dumaresq Shire Council to design a nature lodge accommodation building to host overnight/short education stays for two class sizes on educational visits, as well as holiday accommodation for the fully independent traveler. The building was conceived as a large wool shed style, evoking the wool industry which used to dominate the New England plateau. 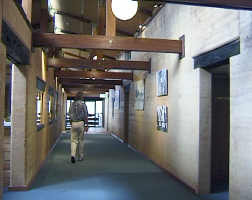 The design features a reused bridge timber trussed roof for the main hall with classrooms and bedrooms annexed to and shielding the southern side. Clerestory lighting is included in the trussed roof design. A stabilized rammed earth feature wall provides a thermal mass for the spine of the building and also provides a good acoustic barrier from the public hall to the other rooms. Ceilings are in compressed straw for insulation and acoustic treatment. External walls were constructed in reverse with masonry on the inside and insulation and corrugated iron cladding on the outside. The lodge's water collection, wastewater, hot water heating is achieved on the remote site by natural means. A gas-fired generator supplies the power.